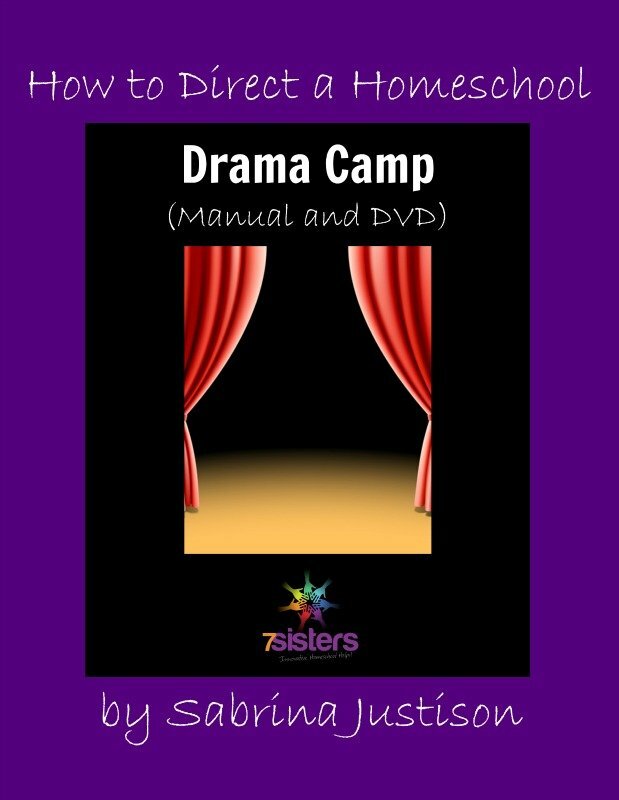 How to Direct a Homeschool Drama Camp, written by Sabrina Justison, is a combination downloadable 39-page manual (.pdf file format) and instructional DVD (sent to you via USPS) that explains step-by-step how you can direct a two-week Drama Camp. You really CAN produce a full-length, high-quality show in only two weeks! Your audiences will be amazed at all you and your cast accomplished in such a short time. Sabrina has been producing annual Drama Camps just like these with groups of homeschoolers in her area (although the material would be suitable for young people who are not homeschooled as well) for over a decade. In this manual and DVD set she shares detailed, step-by-step instructions to make it possible for even a novice director to successfully produce a play with young people in just two weeks. What makes Sabrina’s Drama Camps different from similar-sounding programs offered by community centers every summer? Drama Camp is MINISTRY to students, using drama as a vehicle. Drama Camp MATTERS, telling stories that could change lives to the glory of God. Drama Camp is INCLUSIVE; anyone who wants to be involved is welcome. Drama Camp is PRAYERFUL, and we have other intercessors praying for us as well. Drama Camp is CORPORATE, and teaching teamwork is essential. Drama Camp is NOT DUMBED-DOWN; the material in the script is appropriate for young people to perform, but it is not shallow like so much of the drama material produced for youth groups and the like. The downloadable Manual is 39 pages of detailed instruction, check-lists, and resources for equipping yourself for your Drama Camp. The 36-minute DVD is an overview of the process, and is especially helpful for planning with the other adults who will assist with your Camp, or “pitching the idea” of Drama Camp to your church, homeschool community or support group. Adding this product to your Cart and Checking Out will enable you to automatically download the .pdf Manual; then look for a follow-up e-mail in the next 24 hours to confirm your shipping address for the DVD, to be delivered via USPS. Click here to view an excerpt from How to Direct a Homeschool Drama Camp.